If you’re like me, you probably already know a little about PoE (Power over Ethernet), or you may have even used PoE switches and devices before. However, you may be surprised to learn that PoE can do a lot more than just supply power to a wireless access point or VoIP phone. In this installment of IPIQ, I thought it would be interesting to take a look at a variety of applications for Power Over Ethernet. This is a little less technical IPIQ, so sit back and relax. Luxul PoE switches and PoE devices from Luxul and Lilin. In case you aren’t up to speed on PoE or you haven’t kept up on development, it’s worth briefly reviewing the basics. Put simply, PoE mixes data and power on the same Ethernet cables to provide power to devices like remote network switches, wireless access points, security cameras and more. PoE eliminates the “wall wart,” which can be extremely helpful when devices like Wi-Fi access points or security cameras need to be installed in ceilings where it is often difficult to locate and/or run direct power. 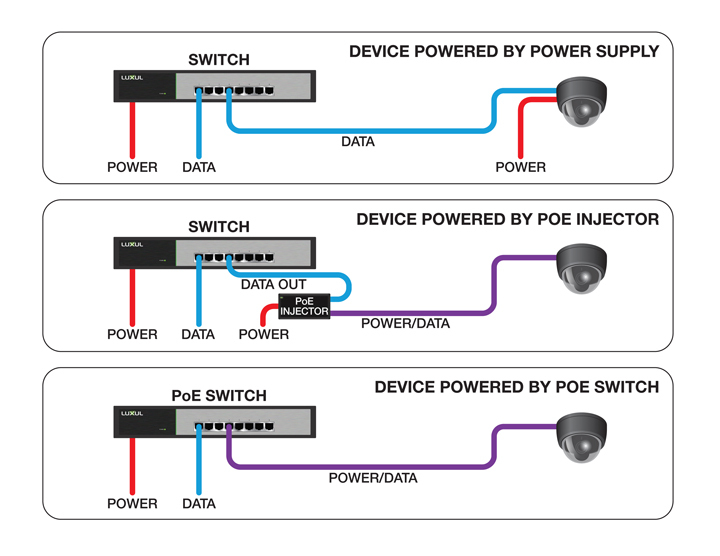 With PoE, power can be supplied either by a PoE switch or from a PoE injector (a small power supply placed between a switch and a powered PoE device). Diagram comparing a traditional powered device connected to a standard Ethernet switch (top), a PoE device connected to a standard Ethernet switch with PoE injector (middle), and a PoE device connected to a PoE switch (bottom). PoE switches or injectors supply a relatively limited amount of power, so only smaller devices can be powered using by PoE. The original PoE specification supported 15.4w per powered device, while the updated PoE+ specification supports devices drawing up to 25.5 watts. As you design a PoE network and make equipment selections, consider the power draw of each PoE-compliant device, as well as the total amount of power required, to ensure you select a PoE switch with an adequate power budget to accommodate all the powered devices simultaneously. For example, if you’re putting together a small video surveillance system with eight cameras, and each camera draws 12 watts, you’ll need a PoE switch with at least 8 PoE ports and a 96-watt power budget. Besides the simplicity of reduced cabling and the convenience of eliminating the need for direct power in difficult locations, PoE offers some other benefits. Almost any device can occasionally require a restart to restore functionality. How many times have you had to climb a ladder or a flight of stairs to power-cycle a device? You’re not alone. With a full-featured PoE switch, an administrator can power-cycle a device from the switch’s built-in management interface. Even better, it can be done remotely. Why roll a truck just because a camera or other device dropped off the network? Take care of your customers right away–maybe even before they know they have a problem! There are a variety of PoE devices currently on the market installers can leverage to solve problems and save money. Following is a list of a few of those devices. PoE-compliant wireless access points can make Wi-Fi network installation a piece of cake. Just pull a single Ethernet drop to the AP installation location, connect the AP at one end and a PoE switch at the other. Small PoE-powered network switches are a slam-dunk in “edge-of-network” installations in small racks or offices where an installer may need to connect five or six devices. For instance, the Luxul AGS-1008M 8-port Gigabit Ethernet switch is PoE-powered and includes a magnetic mounting system for non-permanent installation in a small remote AV-rack. In the last installment of IPIQ, we talked about Just Add Power’s HD-over-IP video distribution adapters. With this system, installers can distributed HD or even 4K video to multiple displays, including IR or control signals, all over Cat6 cables. The receivers can easily be mounted behind the displays, and the system is scalable from just a few sources and displays to hundreds of inputs and outputs. With instant switching, any source can be displayed on any display. Because the system combines simple transmitters and receivers with a managed PoE Ethernet switch like Luxul’s AMS-4424P to do the switching, you can deliver world-class video switching and distribution solutions to a broader base of customers. Just Add Power 3G Ultra HD over IP transmitter and receiver along with a Luxul XMS-2624P 26 Port/24 PoE+ Gigabit Managed Switch. Security cameras like those from LILIN can be PoE-powered, greatly simplifying installation, especially in locations where power is difficult to access. PoE+ capable switches can power even the most power-hungry PTZ (pan-tilt-zoom) cameras. 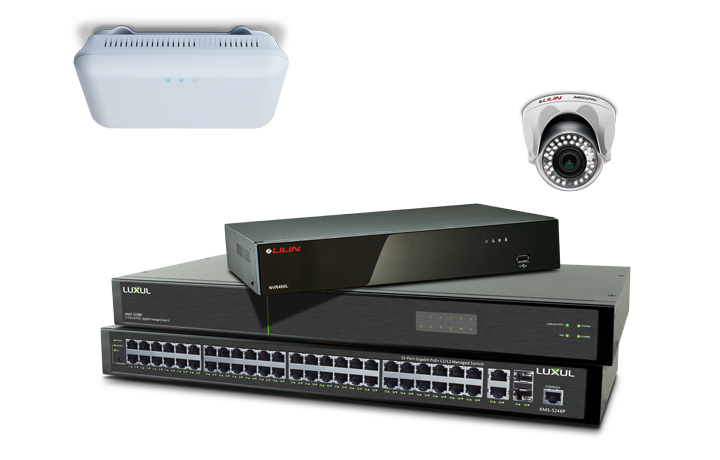 Simply connect cameras and a network video recorder to a managed PoE switch such as Luxul’s AMS-2616P AV Series Gigabit Managed Switch, and you can offer customers a simple, expandable video surveillance system. 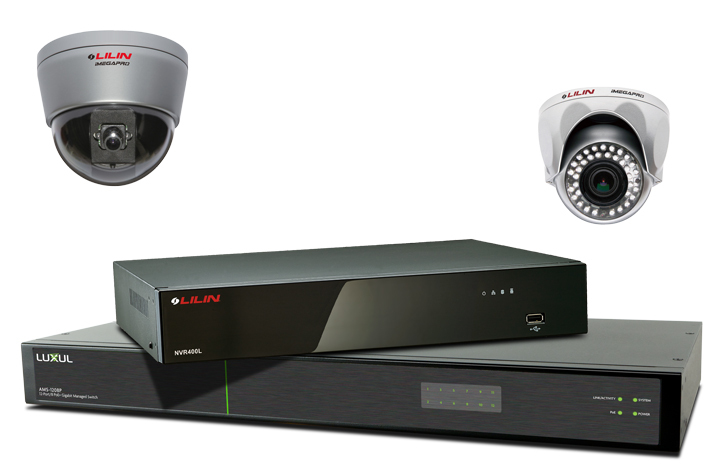 Lilin NVR400L Multi-Touch Stand Alone Network Video Recorder, two Lilin IP cameras, and a Luxul AMS-1208P AV Series 12-Port/8 PoE+ Gigabit Managed Switch. IP speakers are a new type of VoIP device best suited for paging and notification applications. In contrast with analog cabling, digital cabling carries multiple streams of high-quality audio for flexible wiring and system operation. Because the speakers are IP devices, they can be easily individually configured, EQ’d, calibrated and addressed. Controllers can easily automate switching of audio sources and some speakers even support hands-free two-way communication. PoE-powered VoIP phones are nothing new, but the technology continues to mature, delivering advanced connectivity. Beyond simplified cabling, PoE offers the advantage of IT staff being able to remotely power-cycle phones that need to be rebooted to restore functionality. Digital signage is increasing in popularity and installers are capitalizing on this growing market. PoE-powered digital signage players like those from BrightSign have been available for some time, but a popular new PoE-powered product segment is digital displays. These small touch-screen or motion-sensitive displays can be placed in waiting areas or outside meeting or conference rooms for interactive informational signage. Since they require only an Ethernet cable for power and data, they’re easy to install and can be used in corporate, retail and hospitality settings. A surprising new application for PoE is lighting. It’s a new idea, but there are some unique LED-based PoE lighting products available. Because PoE-Plus can supply up to 25 watts to individual powered devices, and LED lighting is nearly twice as efficient as fluorescent, a large PoE switch like the Luxul XMS-5248P Managed Gigabit Switch with its 740-watt power supply can power several dozen LED light fixtures. A control system can then manage the Ethernet switch and the lights, either initiated by users or with full automation based on schedules or occupancy sensing for maximizing energy efficiency. There is a wide variety of other PoE devices available, including access control keypads, synchronized clocks, message boards, video encoders to convert traditional analog camera outputs to IP, thin client PCs, and much, much more. Power over Ethernet can be designed into a new network or as a retrofit to upgrade existing infrastructure. PoE is flexible, safe and reliable, and offers installers and customers a wide range of benefits. With all the exciting applications, PoE helps you address customers’ needs, while delivering a better, more manageable, and more flexible network. Luxul is the leading innovator of simple-to-deploy professional grade IP networking solutions made just for custom installation professionals. Designed for use in both residential and commercial environments, the Luxul family offers a complete line of solutions that simplify network design and deployment—resulting in a scalable network that is both powerful and easy to install. With Luxul, installers can deliver the ultimate IP network without the complexity associated with traditional networking gear. All Luxul products include free lifetime support and a three-year limited warranty. Plus, Luxul equipment is available only through authorized distributors of residential and commercial integration products.